Pattern Description: Below waist skirt has side gathers and an elastic waist. Pattern Sizing: 6-12 and 14-20. I made a 10. Were the instructions easy to follow? The instructions were extremely easy to follow. The only thing that was tricky was sewing the elastic to the waist. Instead of making a casing for the elastic, the instructions have you stretch and sew the elastic along the waistline, fold over once, and sew again to finish the waist. It worked well, but doesn’t look so great on the inside. If I make this again, I will just make a casing. What did you particularly like or dislike about the pattern? I like the side gathers of the skirt. I think it’s a really different look and will work well as office wear. 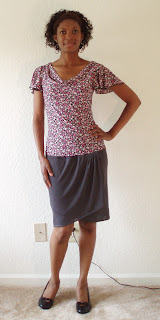 Fabric Used: Charcoal gray polysester stretch jersey from Fashion Fabrics Club. Would you sew it again? Would you recommend it to others? I don’t think I’ll sew this again, but I would recommend this skirt for beginners.